Last month at Toy Fair, Dena and I met the inventors of these fun card games from OK2Win that are perfect for Family Game Night. Plus, they even have some STEM qualities to them, because they are number based and use basic Math principles. 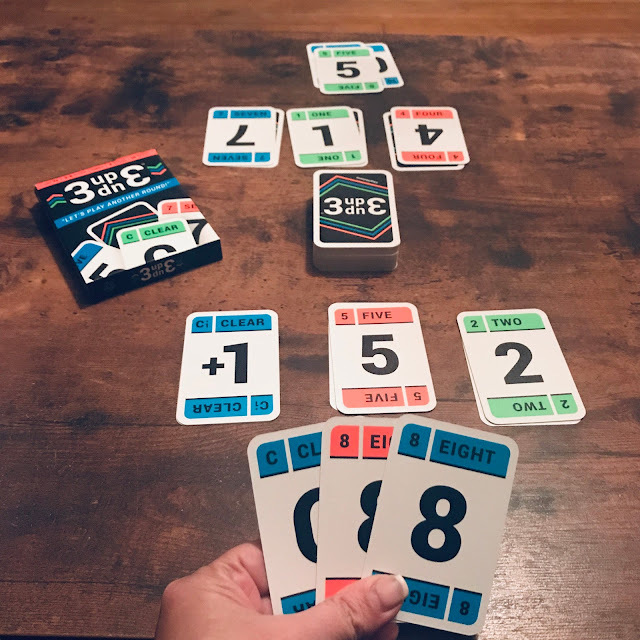 In this fun card game, players receive cards (3Down and 6 dealt, of which three must be placed Face Up on top of your 3Down cards) The object is to discard their cards by having cards equal to or greater than the card shown in the discard pile. There are twists and turns throughout this fun card game that make it interesting and fun! In this fun card game, 9 math cards are placed face down in the center of the playing area. Then 3 Ignite cards are dealt to each player. The object of the game is to make matches, but there is a twist. You can use your Ignite cards to your advantage in this fun, family friendly card game. 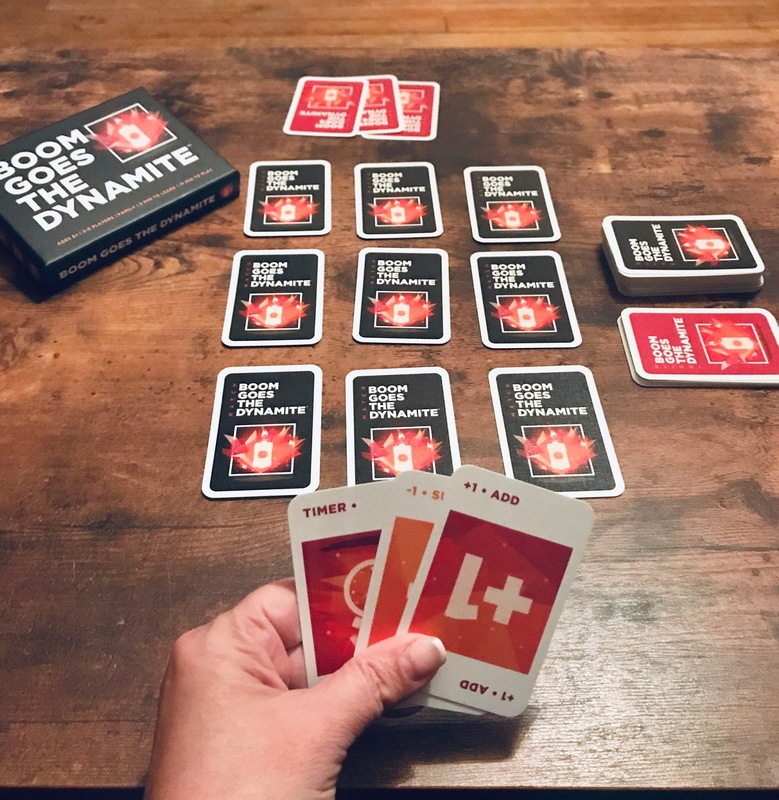 Get the Boom Goes The Dynamite card, and you win every card touching it! In this digital age of Wi-Fi and gadgets, you may be surprised to learn that playing cards continues to be one of the most popular pleasures for kids and adults! Card games can give you a chance to interact with others in an intimate setting while engaging in a little friendly competition. Toymaker Ok2Win has two new decks of cards that are captivating and quick to learn: BOOM GOES THE DYNAMITE ($14.99) and 3UP 3DOWN ($9.99). Family Game Night may never be the same! As evident at last month’s American International Toy Fair, the lost art of the Family Card Game is making a resurgence with card sales booming. 3UP 3DOWN captured nearly $500,000 in sales on Amazon since its debut, one deck at a time. The fast-paced discard game allows 2 to 6 players to play quick rounds involving a little strategy and a little luck. Playing provides a chance for elementary-age students to practice their newly acquired counting skills while also having a blast. The best kind of learning is “stealth learning,” when kids are having so much fun playing that they are unaware they are learning at the same time! Concepts like greater than orequal to are used while picking up or discarding cards numbered “1” through “10.” A family demo video on their website, www.Ok2Win.com makes it easy to get started. 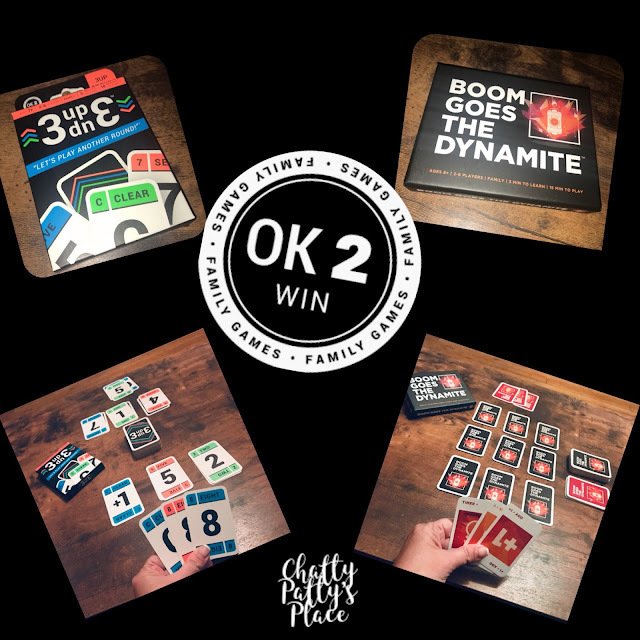 Enter to Win a Prize Pack from OK2Win of these awesome, family fun, card games! All entries will be verified. Only one entrant per mailing address per giveaway. If you have won the same prize on another blog, you will not be eligible to win it again. Entrants who have created social accounts purely for the purpose of entering Competitions or Sweepstakes will not be eligible to win. All social accounts used must be public. The winner will be chosen randomly through Giveaway Tools and contacted via email. A reply to the winning email is required within 48 hours before a new winner is chosen. Void where prohibited by law. One person entering per household, please. Chatty Patty’s Place is not responsible for shipment of prize. Open to US residents of the 48 contiguous states only, ages 18 and older. Disclosure: I received these card games to review for my honest opinion. This post contains affiliate links.